Andrew Cooke is global manager for in-die for PennEngineering, Danboro, PA; 800/342-5736, info@pemnet.com, www.pemnet.com. A well-thought-out in-die-fastening system will take into consideration the operating space, tube and electrical routes, and interfaces with the press and press tooling. Self-clinching fasteners were developed more than 75 years ago as a method for attaching components to thin sheetmetal and to provide robust connections capable of withstanding axial and torque loads. They are particularly useful where components must be accessed and/or replaced, and where loose fasteners would be inaccessible or where they could pose a risk. Self-clinching fasteners create permanent, reusable load-bearing threads and, once installed, will not loosen or fall out. These attributes make them popular in many market sectors, including automotive where they often are the considered solution for many types of applications, including those categorized as safety-critical. Benefits can be enhanced by adoption of in-die-installation technology. In-die fastening can boost productivity when compared to fastener-installation methods that require secondary operations. 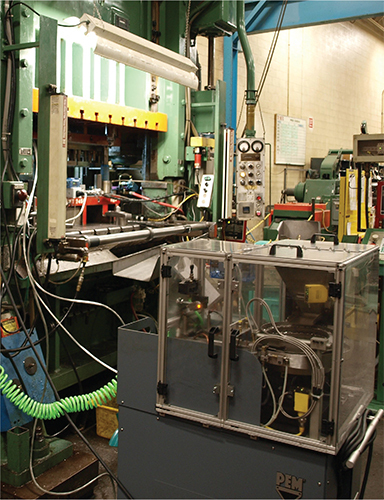 In most cases, secondary operations run at a much slower rate than the primary stamping process and, as a consequence, the metalformer must build stockpiles of parts from the die, which then sit in queue waiting for fastener-installation processing. In-die-fastening options are available. For example, PennEngineering manufactures both the self-clinching fastener (PEM fastener systems) and the installation equipment (PEMserter). PennEngineering provides two standard designs of PEMserter in-die feed carts: one for use with PEM FH, HFH and HFE studs; and the other for PEM S nuts. Both carts feature as many as four feed lines and both are adjustable to suit fasteners with M5, M6 or M8 thread sizes. These flexible designs enable metalformers to use the feed carts for multiple applications, thus minimizing additional investments on future projects, according to company officials. PennEngineering also offers customized PEM feed carts. 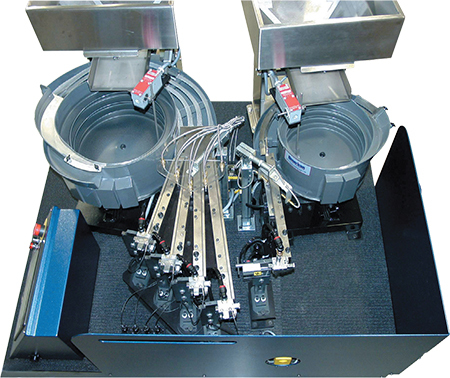 Designs allow for single or dual bowl carts (pictured) and as many as five feed lines per cart. Multiple carts can be integrated with a die to accommodate more points of installation or a range of fastener types or sizes. In-die installation technology is applied most commonly in progressive- or transfer-die applications. Other applications include tandem press lines, bespoke production lines and for single-station dies where the in-die equipment is used to effect second-operation installation. 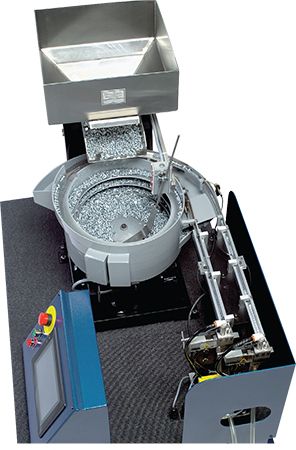 Metalformers may consider this option when wishing to upgrade the fastener-installation process in a running job without investing in a completely new forming die. Self-clinching fasteners, as part of an in-die fastening process, eliminate the need for time- and cost-consuming secondary operations, and reduce work-in-process inventory. Where will the feed cart be positioned in relation to the press? Will the feed cart be accessible for the operator? Is the floor solid and flat? Positioning the cart on uneven or unstable surfaces adversely affects feed rates and feed reliability. Can the die layout be designed to accommodate optimal feed-tube routing? Do we have an adequate clean and dry air supply? At which station does mounting-hole piercing occur—are any folding, bending or stretching operations conducted after the hole pierce but prior to the fastener install? Any such operations may negatively affect mounting-hole position, size or shape. Is chassis alignment adequate at both the hole-pierce and the install stations? Are the fastener-install tools mounted appropriately? Are tailored tooling designs required to facilitate multiple fasteners being installed at the same station? In certain circumstances, pressing multiple fasteners at the same time optimizes the dimensional integrity of the die chassis. Is the installation-tooling design compatible with press stroke, stripper stroke, pad lift and strip lift? Can personnel access installation-tooling subassemblies for in-press maintenance and repair? Do splice-block mounting positions account for correct feed-tube routing, both from the feed cart and to the injector heads? Where will the flag-sensor post and junction box be positioned?